The Concorde+ Treble Booster is housed in our standard sized enclosure design and uses both silicon and germanium transistors in a unique configuration to obtain the best tone qualities from the marriage. When I first started designing pedals in 1961 I produced a Treble Booster that was tried and used by my friends including Jimmy Page who then played in local bands. The circuit configuration I used was a standard textbook example but required careful attention to biasing and selection of transistors to obtain the best from this simple circuit. There were many subsequent commercial versions produced in the 1960's of this type of circuit that followed after the time I first designed mine and now I have designed and produced a much more flexible and enhanced version of my early design. The modern clones produced today of the ultra simple 1960 type treble boosters lack in flexibility and in my opinion are of very limited use. 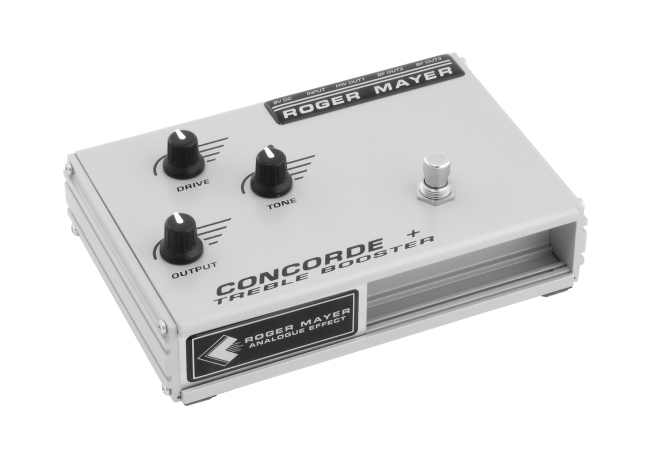 The Concorde + however departs from the clones and uses a unique approach of combining a low noise class A silicon drive circuit with passive tone shaping to drive a fully optimised germanium treble booster. This results in giving the simple circuit new life and explores its sonic boundaries to the maximum. It is now possible to add drive and distortion with EQ before the treble booster section .It is also possible to set the silicon drive section to drive the treble booster section much harder than any guitar pickup could ever do without any added distortion but with the added feature or having EQ prior to the treble booster. So if you want the qualities of soft germanium type distortion overload characteristics that this circuit will produce or you want to explore the more radical germanium distortion possibilities the Concorde+ will oblige. The front panels controls of Drive, Tone and Output control the many tone variations and brings the humble treble booster forward to the future. The operational window has been carefully adjusted to set the gain of the silicon 1st stage to drive the treble booster section with clean signal levels that are higher than those obtained from the guitars pickups. When the drive is increased from it's minimum setting the 1st stage will begin to distort and you now are in the new territory of having smooth distortion followed by EQ and then the treble booster section. This area of operation is very useful as the germanium output stage is driven harder. So it is possible to set the DRIVE control to produce clean treble booster action with enhanced drive and EQ or have a combination both silicon and germanium distortion with inter stage EQ.This unique set up gives brand new life and tone variation. This controls the inter stage passive equalisation between the 1st stage Silicon Drive section and the final Germanium treble booster section. It has been carefully voiced to give a very musical and useful tool when setting up the final desired tone. This controls the final output level, which has more than enough output boost capability to overdrive the 1st stage of the amplifier being used. The Concorde+ has a true hard wire output plus two buffered outputs that can drive long cable lengths with no high frequency loss. These buffered outputs are disconnected when the hard wire output is being used. This means that all performance situations are catered for whether you want a true hard wire output or your situation calls for the advantages of buffered outputs.